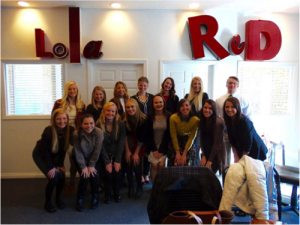 University of Wisconsin–Eau Claire PRSSA Chapter following the agency tour. Photo courtesy of Abby Reimer. Agency tours offer a chance for students to peek into their future careers and get inspired. Meeting with professionals gives the organization access to advice from people who are active and knowledgeable in the industry. Last semester, the University of Wisconsin–Eau Claire PRSSA Chapter traveled to Minneapolis to check out two communication powerhouses: Lola Red and broadhead. Lola Red is a public relations agency that seamlessly melds work with play. The agency works with hotels and restaurants while also managing Lola Pro, which offers off-field branding services for professional athletes including Kyle Rudolph of the Vikings. The agency recognizes that hard work needs a balance, so music plays throughout the day ranging from Mozart to Lil’ Jon. Lola Red is also dog friendly, allowing employees to bring their pups to work. Our tour guide for the afternoon, Julia Carey, didn’t allow our group to get distracted by the cute dogs. After the tour, she sat us down and offered some valuable advice to help us out in our application process. Carey advised us to set up informational interviews with companies of interest. This allows you to interview the employer to see if they’re a good fit. Carey made it clear that being satisfied with your workplace is key, because your happiness is directly related to your success. In regard to resumes, she suggested that young professionals get creative, offering an example of a woman who made a “work” Instagram that features pictures of herself engaged in work-related activities. Broadhead gave the Chapter the opportunity to ask employees questions through a discussion panel. To stay relevant in the industry, the panel advised our group to read Adweek and other similar publications to stay knowledgeable. Another comforting piece of advice is to not feel silly for asking questions. Agency newcomers aren’t expected to know everything, so asking employees questions (and occasionally Google) is not something to shy away from. After touring these two prestigious agencies, the Chapter was abuzz with inspiration for their professional portfolios, not to mention we all gained quite the roster of connections on LinkedIn. Taking the time to experience different work environments will undoubtedly propel your career forward by teaching you valuable networking skills and insider knowledge about the industry. Will you make the effort to visit your dream agency? Abby Reimer is a senior at the University of Wisconsin–Eau Claire. Whether she’s brainstorming creative ways to give her writing an edge or networking with potential employers, she is always active in communication and passionate about her public relations career.